There are great upgrades we can see from the new released iPhone 6 and iPhone 6 Plus. A bigger screen, a thinner body, a higher resolution, a new A8 chip, etc. You may think about downloading favorite or new ringtones for iPhone 6 or just creating a unique iPhone 6 ringtone to make you different from the crowd. Here are some iPhone 6/6 Plus ringtones tips for you. 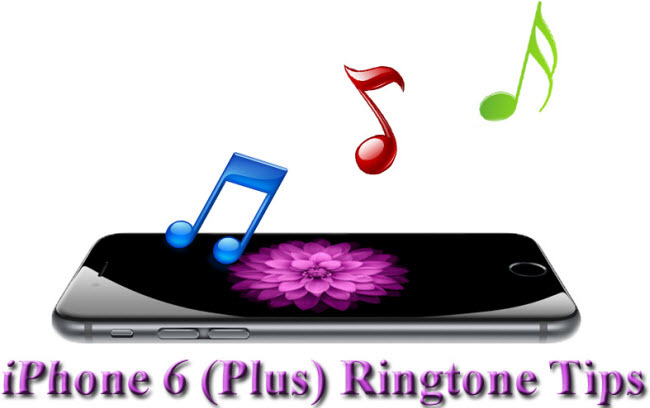 There are a variety of ringtone sites available for you to download desired iPhone 6/6 Plus ringtones for free. Reliable iPhone 6 ringtone websites are including Audiko, iPhone Ringtones, Zedge, MadRingtones, etc. By assigning ringtones to individuals on iPhone 6 or iPhone 6 Plus, you can easily know who is calling from the address book upon hearing the ringtone. You can set a funny ringtone for your boss on iPhone 6, or set a sweet ringtone for your family members on a new iPhone 6. On iPhone home screen, tap the “Phone” app. Tap the name of the person to whom you’re going to assign a ringtone from the “Contacts” list. Then you’ll see that person’s contact information, and tap “Edit” at the top right corner. Scroll down the screen and find “Ringtone” section, and tap it. With this method, you can telling who is calling without looking the phone screen. There are many tools able to create ringtones for your new purchased iPhone 6 or iPhone 6 Plus. For example, you can use iTunes to create a ringtone out of your favorite song. When coming across audio formats incompatible with iPhone 6 (Plus), or just want to extract and keep the audio from a piece of video and take it as the iPhone 6 (Plus) ringtone, you need a more powerful iPhone 6 (Plus) ringtone maker – Pavtube Video Converter Ultimate for Windows/Mac (Best Video Converter Ultimate for Windows Mac), which not only enables you to extract audio from video to create iPhone 6(plus) ringtone formats, but also convert incompatible audio files including AC3, FLAC to iPhone 6 (plus) compatible ringtone formats.